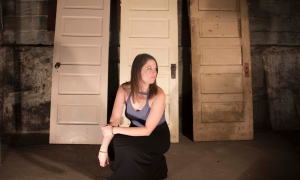 Liz Bills is a vocal powerhouse and singer/songwriter from Boston, MA. Bills is known for being vulnerable and passionate in her songwriting and stage performance; openly discussing mental health, female empowerment and many other sensitive issues. Highlights with her rock band Analog Heart have included winning Rock Act of the Year in the 2018 New England Music Awards, winning the opening spot for Bon Jovi at Mohegan Sun in 2017, runner-up in the 2016 Aloft Rising Star with Daughtry, and a semi-finals appearance in the WZLX’s 2016 Rock Rumble. Liz was a top 30 female finisher in the 2013 American Idol competition, and has been compared to singers such as Grace Potter, Janis Joplin, and Florence and the Machine. WYN is the solo project of Amy Wynne Doran, a lead singer/songwriter of indie-folk-rock group Strangers by Accident (http://www.strangersbyaccident.com/). She studied songwriting independently with Ben Folds and Katie Toupin (of Houndmouth) in preparation for her first solo record set to release in early 2019. Her songs dig into her personal stories of living with chronic illness and overcoming depression, with influences stemming from the likes of Amy Winehouse and Nancy Sinatra.